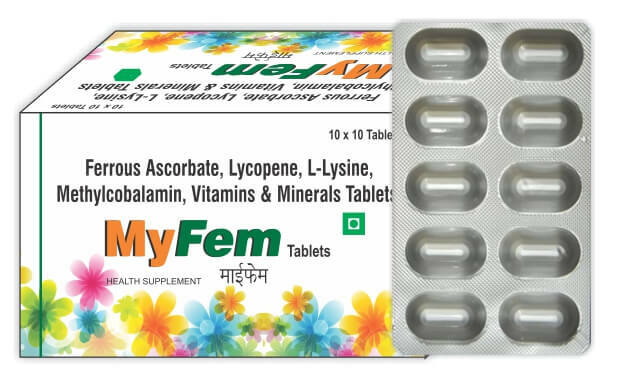 Ferrous Ascorbate, L – Lysine, Lycopene, Mecobalamin, Folic Acid, Vitamin D3 and Zinc with Selenium tablet is a synergistic combination of the nutritional substances – which helps in anaemia. This product is a versatile, high – potency Iron with essential nutrients as the primary dietary supplement for all types of consumers especially women and those who are not able to take a balanced diet with recommended serving of fruits and vegetables due to their hectic life style and untimely food habits and not eating enough foods. These nutrients are needed by the body for the formation of red blood cells. If the body does not receive adequate amounts of these nutrients, anaemia can develop. During pregnancy the daily requirement for these nutrients increases. This combination is used for iron deficiencies in human, useful in anemia caused by low levels of iron or folate in the blood. It is also used in pregnancy for low blood levels of iron and to supply folic acid to the body. Iron deficiency anemia (IDA) is a blood condition in which the body fails to make enough healthy red blood cells. IDA is caused by a deficiency in iron, a mineral that acts as an important building block for red blood cell construction. It's the most common nutritional disorder in the world, affecting mostly women and children. The two main causes of IDA are blood loss and low iron. Blood loss can occur from menstruation, recent major surgery or trauma or peptic ulcer disease, among other causes. Iron is essential to human health, in that it is necessary for cell growth and differentiation and aids in oxygen transport to tissues. Most of the body's iron stores, about two-thirds, are found in hemoglobin. Hemoglobin is a protein in red blood cells that brings oxygen to the tissues. Iron is also found in myoglobin, which brings oxygen to muscles. The intestines regulate iron storage in your body; when your iron stores are low, your absorption of iron increases. Without enough iron, anemia can occur, resulting in fatigue and weakness. In this formula, Lycopene, Lysine, Vitamins, and minerals are all substances the body needs to be healthy, and they interact with each other to promote optimal wellness. Sometimes supplementing with an amino acid can help the body better absorb a vitamin or mineral, and lysine and iron are good examples of this. Ferrous ascorbate provides a significantly higher rise in hemoglobin levels in comparison to colloidal iron. Lysine helps the body better absorb iron. Lycopene used in iron-mediated oxidative stress, proliferation and autophagy in liver due to its potent free radical scavenging and antioxidant properties. Methylcobalamin plays an important role in helping the body make red blood cells. Folic acid is vital for the biosynthesis of purines and thymidylate of nucleic acids. Vitamin D3 is required to help the body function normally. It especially affects the formation and health of red blood cells. Since, vitamin D is needed to help red blood cells use iron, a deficiency of vitamin D is associated with anemia. Zinc with iron is both required to build red blood cells (RBC), supplementing with both minerals is more effective in anemia. Selenium deficiency may cause a secondary overload of iron and unbalanced distribution of other minerals. Lysine is the anti-anemic agent in the deaminized caseinanemia syndrome. Lysine, also called L-lysine, is an essential amino acid. This means the body needs it but cannot make it naturally, so it has to be acquired. Amino acids help make protein and are important for healthy growth and development. Lysine is especially important in making carnitine. Carnitine converts fatty acids into energy and helps to lower cholesterol. The lack of lysine in the diet may also lead to a breach of hematopoiesis and decrease the amount of hemoglobin. Lysine helps with the building of muscle protein, it is useful for patients recovering from injuries and recovery after operations, and there might be use in lysine to help maintain healthy blood vessels. Ferrous ascorbate is a synthetic form of iron and vitamin C. Iron is recycled by the body and produce erythroid precursor cells. Ferrous ascorbate has high bioavailability with least GI side effects. All dietary iron has to be reduced to the ferrous form to enter the mucosal cells; therefore ferrous iron is absorbed three times more readily than the ferric form. Iron is essential element carrying oxygen, forming part of the oxygen-carrying proteins - hemoglobin in red blood cells and myoglobin in muscles. It is also a component of various enzymes and is concentrated in bone marrow, liver, and spleen. The production of hemoglobin and myoglobin (the form of hemoglobin found in muscle tissue) requires this nutrient. It forms part of hemoglobin, the component of the blood that carries oxygen throughout the body. People with iron-poor blood tire easily because their bodies are starved for oxygen. Iron is also part of myoglobin, which helps muscles store oxygen. Lycopene is a member of the carotenoid family of phytochemicals and is the natural pigment responsible for the deep red color of several fruits, most notably tomatoes. The health benefits of lycopene are attributed primarily to its powerful antioxidant actions. Folic acid, also known as Vitamin B9, is also referred to as folacin or folate and its chemical name is pteroylglutamic acid. It is important for healthy cell division and replication, since its involvement as coenzyme for RNA and DNA synthesis. It is also required for protein metabolism and in treating folic acid anemia. The need for folic acid increases considerably during pregnancy. Deficiencies of folic acid during pregnancy are associated with low birth weight and an increased incidence of neural tube defects in infants. Exogenous administration of folic acid is essential for normal erythropoiesis process. Zinc is an essential trace mineral found throughout the body, often in conjunction with protein. It is transported in the blood via the protein albumin, so low albumin levels often mean poor absorption of zinc as well. Zinc is a cofactor used to activate dozens of enzymes in every organ in the body. Zinc deficiency results in dysfunction of plasma membrane proteins, which present with some pathological features. Anemia and zinc deficiency are both common in patients with chronic uremia. Oxidative stress of the red blood cells (RBC) and their subsequent life span reduction are suggested to play an important role in the development of anemia in patients with chronic uremia. Zinc with iron change the average RBC count; it also raised average hemoglobin levels from 10.3 to 11. Increasing red blood cells generally raises hemoglobin. Vitamin D is required for bone and mineral metabolism as well as muscle strengthen and immune system functioning. It is also linked to anemia, which is the lack of enough red blood cells to supply oxygen to tissues of the body. Vitamin D, also known as the sunshine vitamin, can be produced in the body with mild sun exposure or consumed in food or supplements. Vitamin D is very important for strong bones. Calcium and phosphorus are essential for developing the structure and strength of bones and vitamin D absorb these minerals. Vitamin D is important for general good health, and researchers now are discovering that vitamin D may be important for many other reasons outside of good bone health. Selenium is a trace mineral that is essential to good health but required only in small amounts. Selenium is incorporated into proteins to make selenoproteins, which are important antioxidant enzymes. The antioxidant properties of selenoproteins help prevent cellular damage from free radicals. Selenium aids in the production of antibodies, and in protecting the immune system. Selenium is required to maintain tissue elasticity, and to support the healthy functioning of the pancreas and the heart. The combination is used for Pregnant and Lactating mothers but the combination should only be used if benefits outweigh the risk.